Montreal summers are arguably the best time in the world. (Yeah, we said it -- the WORLD.) When the temperatures soar above 30 degrees celsius, the whole city comes alive and pours onto the city’s rooftop restaurants and terrasses to toast their joie de vivre. 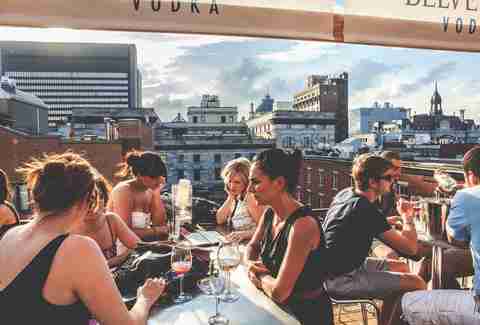 So the next time you’re looking for a place to sip a chilled glass of wine or icy cocktail, check out our picks for Montreal's best summer terrasses. After giving us one of the city’s most explosive Vietnamese menus, chefs Hà Nguyen and Ross Louangsignotha continue to win us over in warmer weather with one of the city’s most colourful terrasses, perfect for eating cold papaya salad and cod fritters on. And in an area as steeped in colour as the Plateau, that’s an impressive feat. The vibe here is decidedly Young Professionals Letting Loose, and the view of the port is enough to stop you in your tracks. Come here for loud music and to leave your troubles in glasses of chilled rosé and the prettiest, multicolored sangria you've ever seen in real life. Despite only being open for just over a month, 3734 wins us over by offering what might be the one of nicest ways to have your breakfast: lounging on a cute terrasse outdoors. So next time somebody asks you how you’d like your eggs, tell them "al fresco." In the city’s hippest neighbourhood, Le Richmond has become the hangout of the new Montreal up-and-coming elite. The drinks here ain’t cheap, but it’s worth it for the converted loft space's decor, upscale vibe, and the feeling like you’re winning at life. Might as well get some oysters, burrata, and swordfish crudo to share while you're there, since Le Richmond doesn't let you drink without eating too. 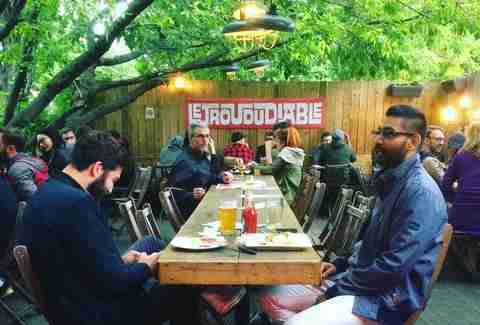 These venerable Montreal institutions share one patio, and it couldn’t be more appropriate for the neighbourhood. 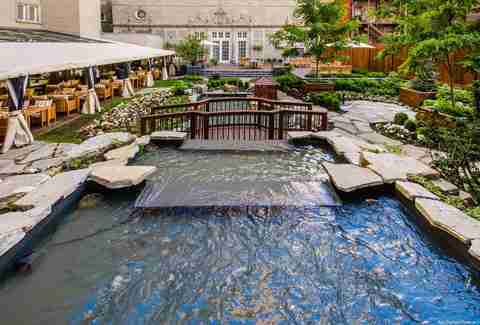 Just a few long tables, some ferns, and a trout pond will make you feel like you’re at the best backyard party around, with some of the best food. 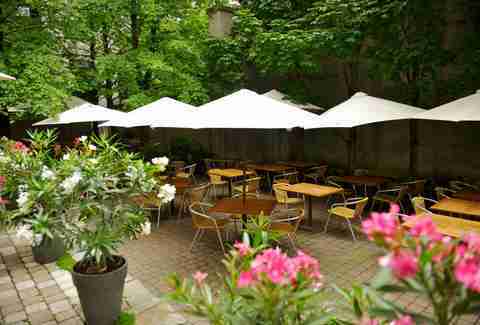 For a more quaint and secluded terrasse experience, seek out Il Cortile’s hidden garden. With a beautiful set-up and a clandestine vibe, this quaint spot laden with fresh flowers will make you feel like you’re in the Tuscany countryside. 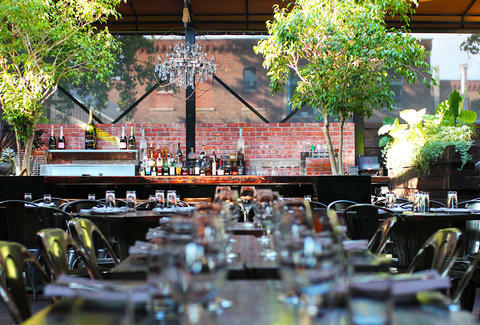 Tucked away in a dark back alley, Le Sainte-Elisabeth may not look like much from the outside. 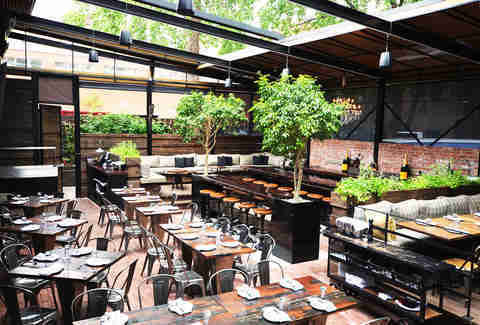 But when you pass through the little bar and step out onto the terrasse, you will find a little piece of shaded, wooded paradise -- dozens of tables artfully arranged between trees and trailing vines that go all along the encircling walls. 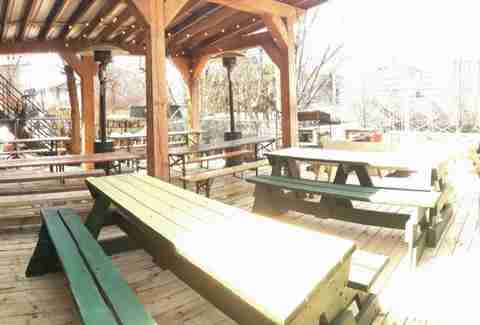 It’s one of the prettiest places you can find to enjoy a casual drink with friends. 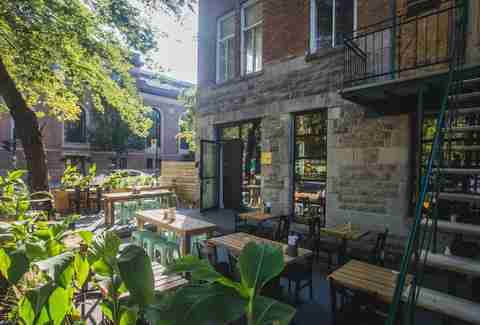 We couldn’t complete a terrasse list without mentioning an oldie that has made a name for itself with excellent food, an authentic Montreal atmosphere, and its eclectic backyard. 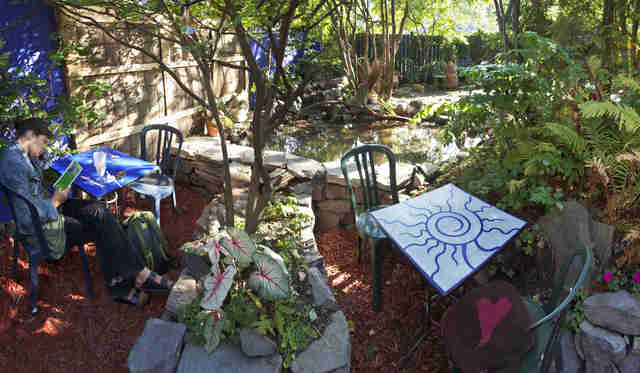 For strong coffee and hippie sandwiches, come to Café Santropol, grab a spot by the fish pond, and let the city wash all over you. With food that screams of Quebec terroir, design that gives a nod toward Nordic cuisine, and an atmosphere that brings to mind some of the most secluded spots in the world, you can expect Hvor’s terrasse to be absolutely unique -- which it certainly is. Located in the midst of the restaurant’s organic garden, this 900sqft terrasse feels like a slice of heaven in the heart of Montreal. This enclosed backyard patio is not much more than one big, long communal table... which is precisely why it’s one of the best, most intimate ways to spend an afternoon outdoors. Sip on one of its many local beers and ciders, order an excellent plate of local, seasonal food, kick back, and relax: Vices & Versa is what summer in Montreal is all about. One of the most stunning views in the city is quietly on top of a nondescript hotel right by the boardwalk of Old Montreal. Duck into a hidden entryway, take a rickety elevator up to the fifth floor, and then follow the sound of laughter and clinking glasses to discover a breathtaking vista of the Old Port. Fair warning: the sangria pitchers here are killer. 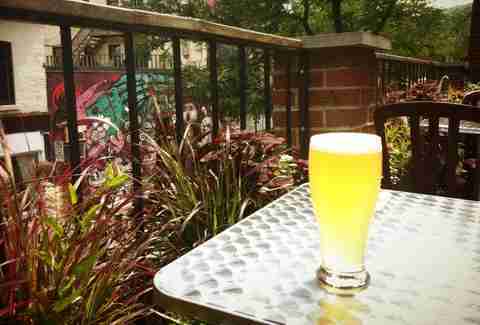 A chill, low-key microbrewery with a nice view overlooking one of the most picturesque streets of the Plateau. You could do much worse than spending a Thursday night on the Reservoir’s rooftop terrasse. 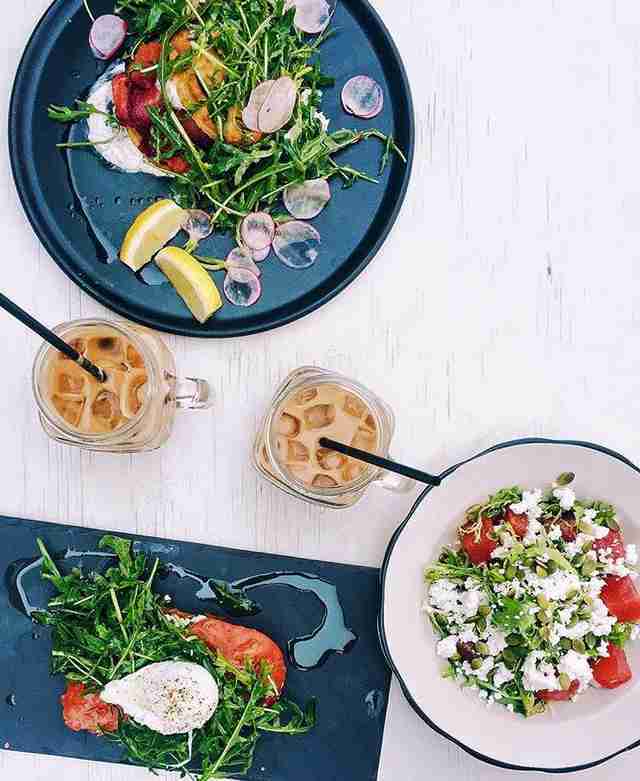 And because the menu is entirely vegetarian, you finally have a go-to spot to hang with your friend who's cut meat from their diet. 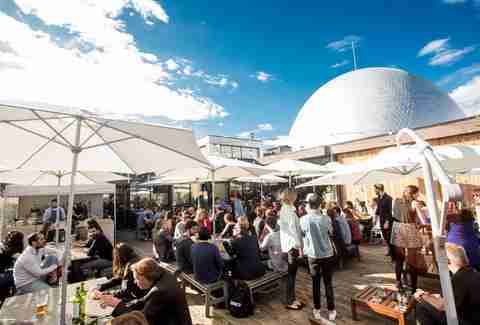 The secret of Montreal’s best parties lies on the rooftop terrasse of Foodlab, the Society of Technological Arts’ foodie playground. This is where rising-star chefs demonstrate their skills on one night, while a complete unknown will offer a workshop on food photography the next. Whatever the theme of the day, the food here is always excellent, the drinks generous, and the atmosphere electric. 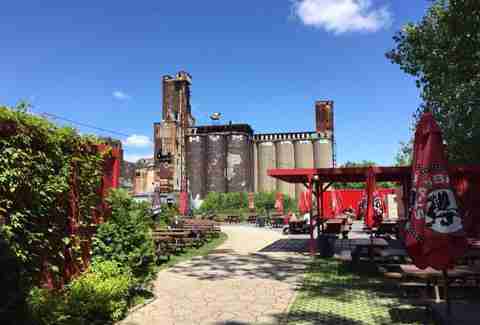 With a stunning view of one of the city’s landmark abandoned grain silos and the Lachine canal, Terrasse St-Ambroise could not be located in a more Montreal-like spot. Bring your dog(s) and order one pitcher of in-house beer after another. Walking along rue McGill, all one sees of Boris Bistro is a torn-down building facade with a small gate. Compared to the grandeur of its surroundings, the tree-shaded, overgrown little enclave feels like an abandoned yard... that is, until you're lured into a real-world fairytale land. Little bistro tables hiding under large green parasols, fantastical lighting, and beautiful planted flowers make this place feel like a dream. 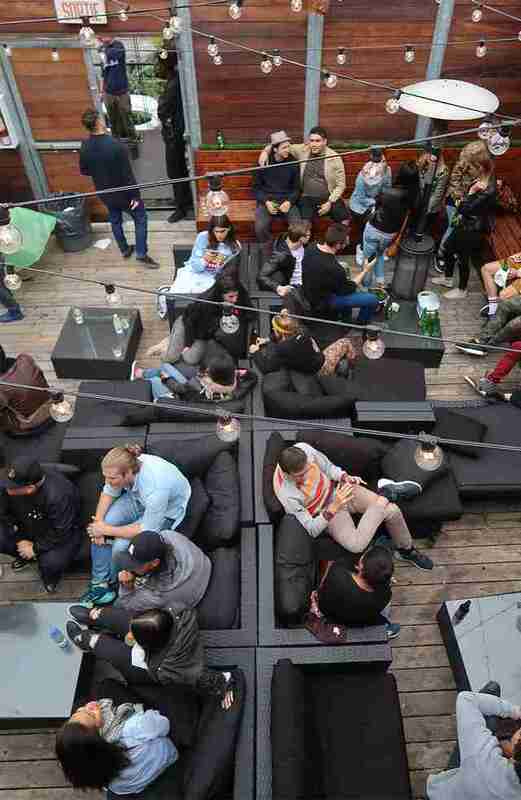 One of the city’s loudest bars, known for its crazy DJ nights, turns into open-air debauchery when its rooftop terrasse opens -- but it's undeniably cool. Who can blame people for getting excited once they hit the roof? Thursday through Sunday is when you'll find those big parties. 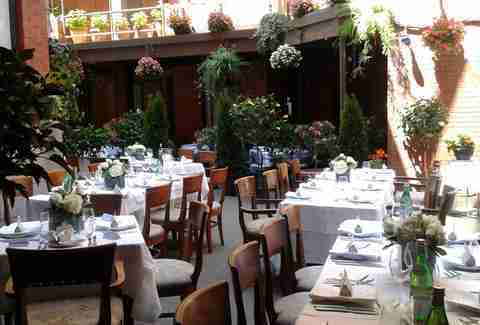 If you're lucky enough to be able to afford a table at Maison Boulud, Chef Daniel Boulud’s restaurant at the Ritz-Carlton, then you simply must sit outside in the hotel’s secret backyard. Eating exquisite food amidst flowing waterfalls and perfectly manicured lawns, you'll feel like you're being treated to your own private estate. Ksenia Prints is a freelance writer and food blogger, photographer, and recipe developer for At the Immigrant's Table who likes to lose herself in a glass of chilled wine on a shaded summer terrasse. Follow her exploits in the kitchen and beyond at @immigrantstable.